For those of you who are inclined to the three piece suit (and there are a lot of them out there from which to choose even in the ready-to-wear market), please be aware of the need to wear braces. Now, this is old hat for some of you, but for a newer generation raised wearing jeans and other lower rise trousers meant to rest on the hips, it may come as something of a surprise. Ms. Bruni is delectable channeling Audrey Hepburn. But she is a former model and very image conscious. Mr. Sarkozy, on the other hand…. Trousers a bit too long? Yes. Sleeves hiding knuckles instead of showing a bit of linen? Yes. Vest/waistcoat poking out from under the points of the tailcoat? Yeah, afraid so…. . And is that…? Contrast those photos with yesterday’s photo of Nick Foulkes and this of a beautifully tailored King Juan Carlos, from the same reception. The belt not only allows the trouser to slip onto the hips, instead of floating at the waist, when it does so it exposes a billowing expanse of shirt front under the vest/waistcoat and a belt buckle under the mother-of-pearl buttons, it also pops open the trouser pleats for the full “middle management wearing khakis on casual Friday” look. When we wear three piece suits, of any description, it is essential that we wear braces/suspenders to keep an unbroken line from trouser to waistcoat/vest. In fact, the line should remain unbroken by buckle or shirt front whenever you wear a coat and trousers. See the dust jacket photo of Van Day Truex for a perfect illustration. This is especially tricky with the lower rise of today’s slimmer trouser. I can see why the current look is to leave your belt at home, although this does not solve the shirt issue. The solution is to cut a longer vest/waistcoat, but the proportions will be put off even further that way. While you draw our attention from Ms. Bruni to Mr. Sarkozy’s belt we missed the loosely hanging pre-tied tie. David, how right you are and how silly of me not to have mentioned it; the list seemed too long. Is just me, or has King Juan Carlos used a cardboard cutout for his bow tie? Carla Bruni is extremely stylish and sets an elegant example for modern ladies today. Since the deaths of Princess Diana and Jacqueline Kennedy Onassis, there has been a real void of truly stylish women to watch and take ques from. Love that Audrey hairdo–our daughter pulled the same look for her senior prom wearing a lipstick pink Marc by Marc Jacobs knee-length dress and vintage clip-on earrings, perfect for an 18 year-old senior in high school. The height of hair is feminine and tidy at the same time. Compare that to the big hair of the 90’s (i.e. all of the Trump women!). I am not qualified to comment on the men’s formal wear except to say Mr. Sarkozy just doesn’t look as spiff as his adorable wife. It’s all in the details. Excellence occurs at the edges! Turling, I cracked up about his cardboard tie! Yeah, Sark is a bit sloppy at times, but I guess a lot of men would look enviably silly next to a Carla Bruni. I do like, however, Sarkozy’s simple manner of dressing during normal work days. Dark tie, dark suit. 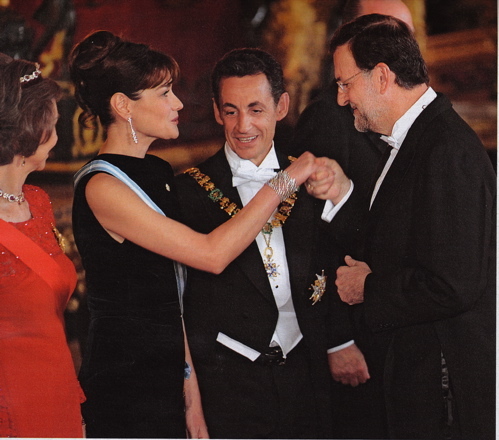 I think one of the reasons King JuanCarlos looks good and Sarko does not is that HRH is at ease. 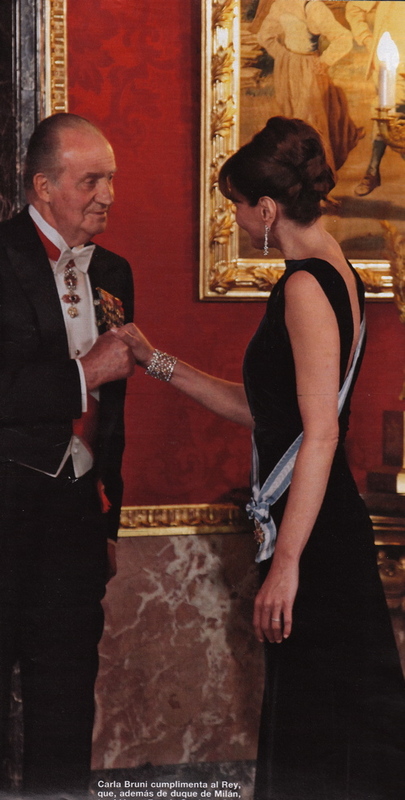 Royals grow up having to wear all sorts of silly costumes and so look comfortable in anything they wear.Sarko looks like an amateur actor; Carla however looks absolutely relaxed. I agree with Paula that it’s all in the details. I like the fact that Madame S is wearing pale nail polish,not garish red or black, and just the right amount of jewelry.And Paula, I love your expression ‘Excellence occurs at the edges’. iCG, absolutely right. I do wear a pair of white silk, white tabbed Thurston’s with evening clothes, especially when wearing a cummerbund or a double-breasted DJ. With the vest/waistcoat in place I may break out and wear a fancy pair. But like wearing your sock garters, it’s a risk. I’m shocked by Sarkozy’s sartorial solecisms. The belt is appalling. I love perfect pitch in a man’s trousers. As a matter of fact I find both him and Carla faintly annoying. Fun fact: Sir Charles Mendl, husband of the interior decorator Elsie de Wolfe, had a strangely perfected use of braces, et cetera, to ensure that he always looked spiffy, no matter what the extenuating circumstances. According to Ludwig Bemelmans—I must look this up, so am winging it here—Mendl had his shirt tails made so they buttoned inside his trousers, ensuring that no billowing ever occurred. There were other details too, which implied an enormous time being buttoned into and out of his clothes. AL, I do own a couple of those suspenders that attach from shirt tail to top of sock… military surplus from Dad. But we do look goofy rigged out thus. OMG! When it comes to fashion, French can do it splendidly well! It’s in their blood! I love Paula’s last comment, “Excellence occurs at the edges”. How right you are! I have always worn braces when wearing a 3 piece suit. Sometimes I find though that the braces start to peak out at the sides of the vest. Does anyone have any tips on how this can be avoided? Hello Peter and welcome. Hmmm. Perhaps the vest is too short or the waist on your trousers is too low? I’ve never had that issue with my suits, but they are not the new slim cut style. As long as they don’t show (or your shirt front either) when wearing your coat, I wouldn’t worry too much. let me clarify. The braces show at the chest at the armhole, not at the waist. I never let anything show between vest & trousers at the waist! Peter, Ah! Well that’s better. Sounds like the armhole on the vest may be needed to be taken in. Or you may try a different width of strap that will sit higher on your shoulders. Unless the braces aren’t doing their job very well, I wouldn’t worry too much about it. Your coat will cover the area nicely. If you have it off, then you are in shirtsleeves and some degree of leeway is expected. Thanks! I am really enjoying your blog. If you ever want to sell that 60’s 3 piece you have that you showed off in your piece about dressing to travel let me know. I would give it a very good home! I love vintage 3 piece suits! You’re welcome! I couldn’t part with it. It was Mrs. E.’s grandfather’s, made by Gieves. It may be as close to the Row as I’m ever to get! Thank you for the comments and for asking my opinion, too.